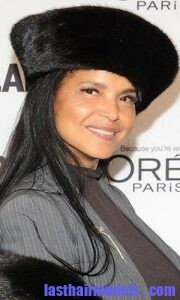 Victoria Rowell is wearing a simple hairstyle that can be achieved without going to a hairstylist. You must use a one inch flat iron over your hair to get this hairstyle. Most of the time she used to wear her hair fully straight and this is the most common way of styling your hair. Make sure to mist the hair with a hairspray to keep it away from damage during the straightening process. First mist the hair after washing it as usual and this will help to prevent the hair from getting damaged due to the heat produced by the tool. Then comb your hair using a small tooth brush and this will add slight tension over your hair. Then make a middle part in your hair and brush it again to remove the tangles. Make a section on top of your hair and keep the comb below the hair section to comb through it to make it smooth. Now you can try to straighten the hair using the flat iron in sections all over the head. Victoria Rowell used to wear a completely straight hair, so make sure that your hair gets straightened fully to achieve the same look. At last mist the hair with a hairspray to add little bit of shine in it. You can also refer few photos of Victoria Rowell to achieve the same kind of look in your hair and use the flat iron very gently.